If there’s a rising force in the modern custom world, it’s Indonesia. 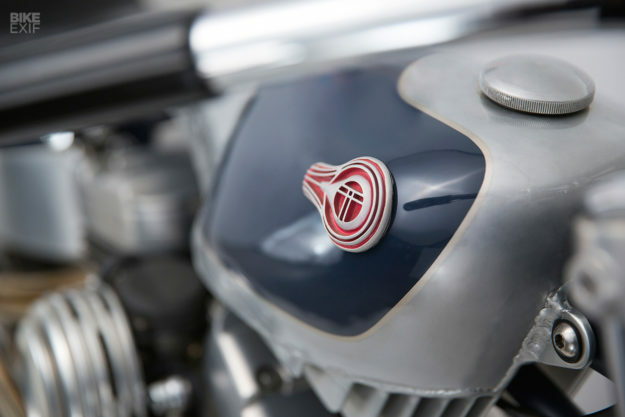 It’s no longer surprising to see a world-class middleweight café racer roll out of a Jakarta workshop, and the top shops are now spreading their wings and tackling the heavy metal. One of those shops is Thrive Motorcycle, with a sweet succession of Yamaha and Royal Enfield builds to their name. They’re often pushing the design envelope into angular new directions rarely seen before. 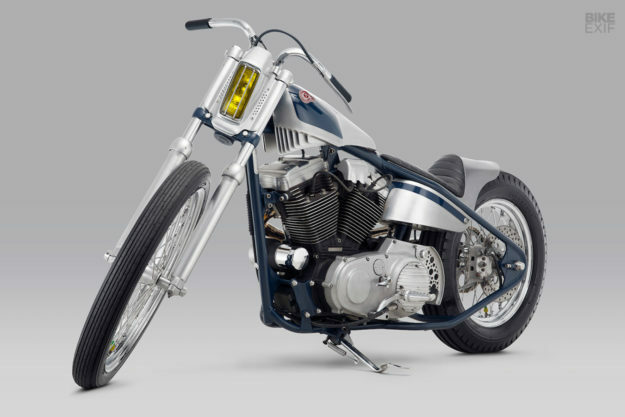 It’s still a surprise to see the chopper influence in this latest build, even though it retains the super-clean lines and finishing we expect from ace fabricators Indra Pratama and Barata Dwiputra. 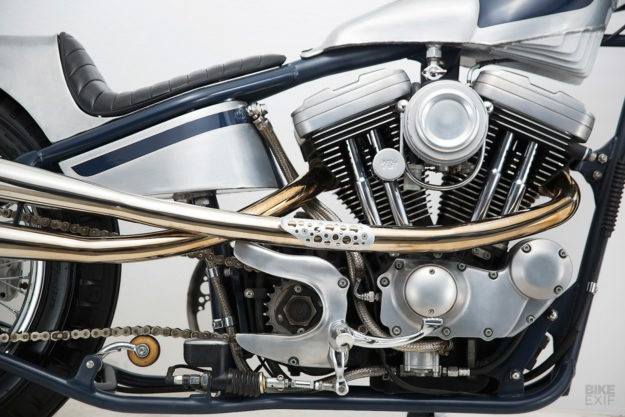 The engine in question was from a year 2000 Harley XL1200 Sportster, and part of an order direct from the USA. The Evo motor was in rude health, and suited Reuben’s desire for a reliable, modern drivetrain. 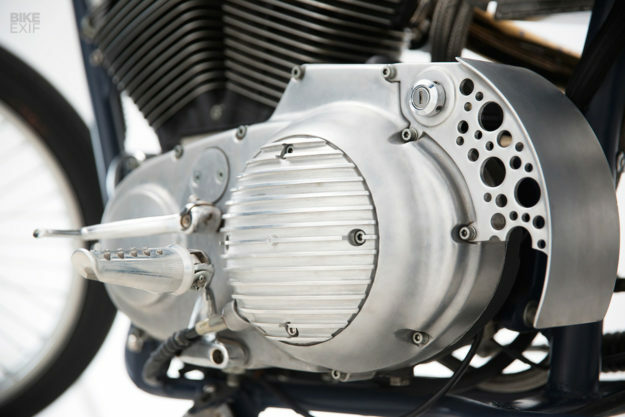 Thrive has a custom parts division called T/H/R/V, so the V-twin became the test bed for a whole range of new parts—mostly primary, cam, sprocket and rocker covers, plus a new air filter. “We visited a couple of workshops in Japan and saw a lot of great bikes at the Yokohama show—especially the ‘traditional Japanese’ chopper.” The XL1200 is now called Kuzuri, which translates to ‘wolverine’ in Japanese. A custom rigid frame was ordered from metallurgical wizard Andi at Brodonolo Custom Garage, an eight-hour drive away in Central Java. As soon as it was finished, Thrive starting measuring and shaping aluminum sheet. Over several months, the Thrive crew fabricated the new bodywork in-house. 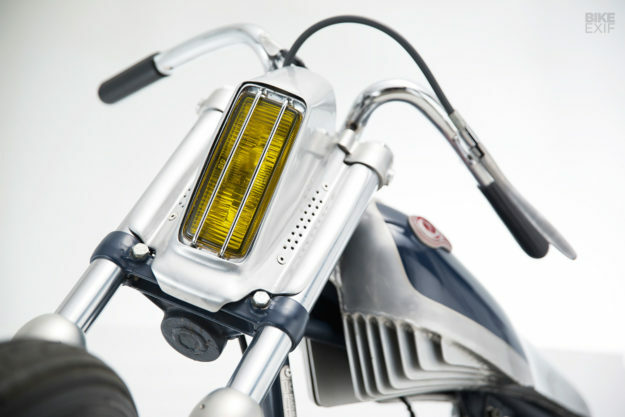 That meant building a gas tank, the sleek tail unit (which does double duty as a fender), the oil tank, the electrical box, and the headlight surround. 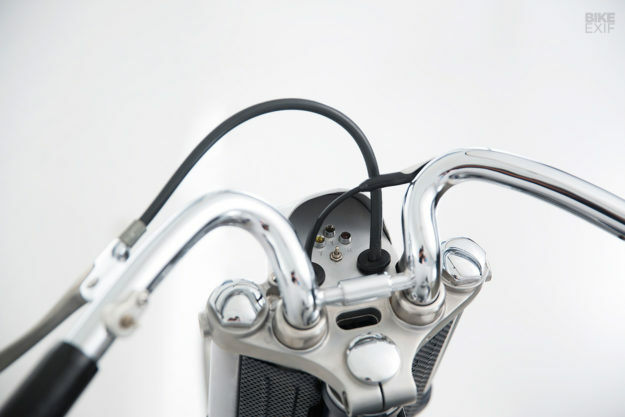 Thrive’s own custom parts are everywhere, right down to the breather system and exhaust shield. There’s an Avon Speedmaster on a 21” wheel at the front, with a classic ribbed Firestone on an 18” rim at the back. 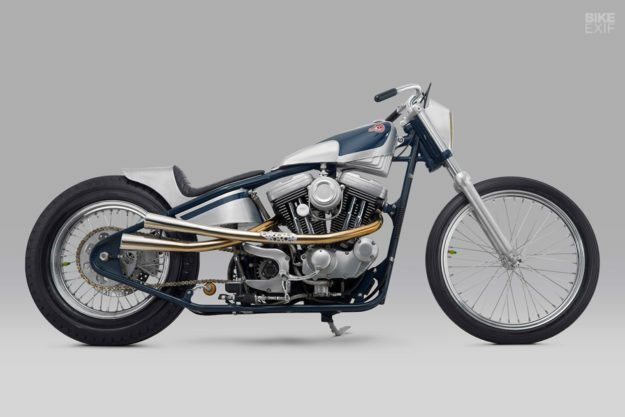 A modified Softail rear brake setup (hopefully) hauls the bike to a stop. 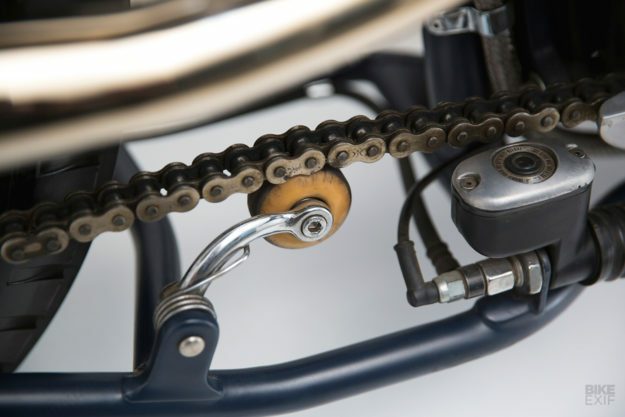 Power hits the back wheel via a chain conversion, and there’s a neat custom chain tensioner made from a skateboard wheel. 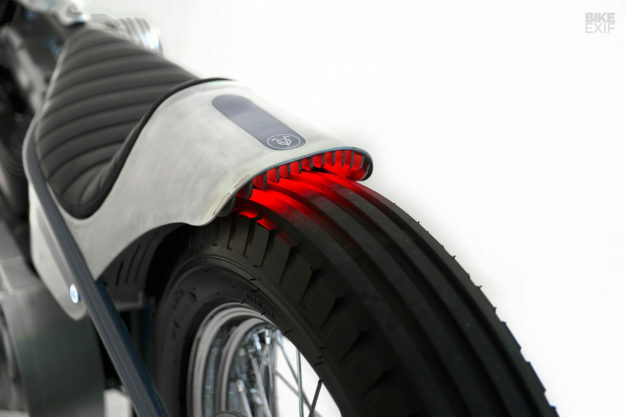 The neatest touch is perhaps the taillight hidden under the rear fender; the rear turn signals are hidden inside the rear frame. The level of craftsmanship throughout is astounding. 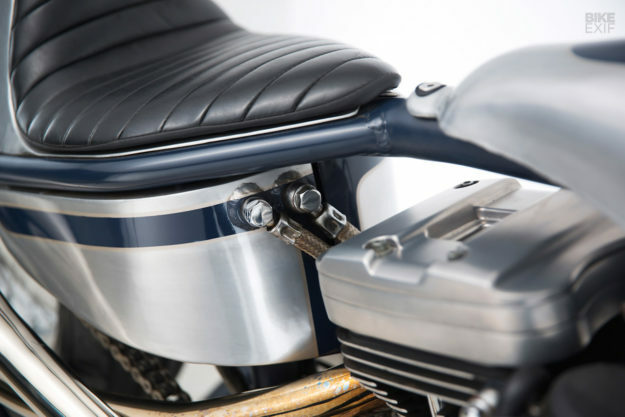 After a few sessions of vapor blasting for the raw metal, the engine was powder coated black and the bodywork sprayed in a delicious mix of Sapphire Blue and silver. 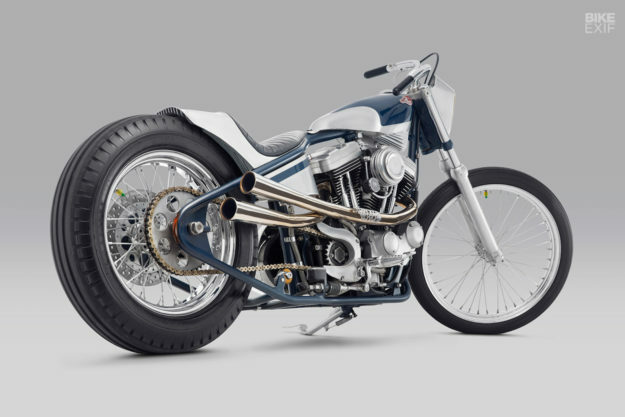 We’d never call ourselves experts on the chopper scene, but even we can see that this XL1200 is something out of the ordinary. 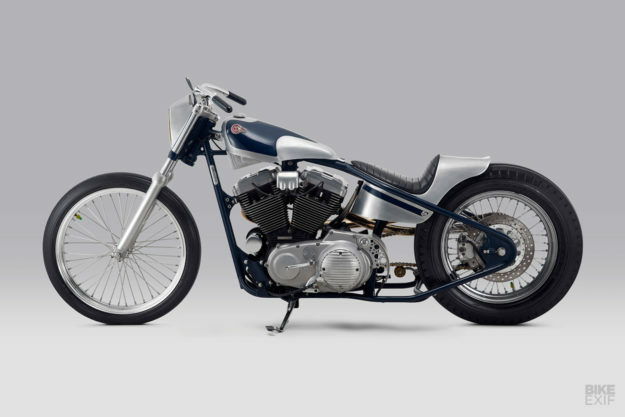 We reckon it’s time that the Thrive crew took another trip to the Yokohama show, this time with the Sportster in tow. They might just return home with a little extra something in their luggage.